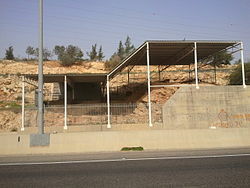 Qesem cave is a Lower Paleolithic archeological site 12 km east of Tel Aviv in Israel. Early humans were occupying the site by 400,000 until c. 200,000 years ago. 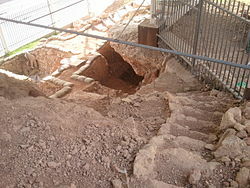 The cave attracted considerable attention in December 2010 when reports suggested Israeli and Spanish archaeologists had found the earliest evidence yet of modern humans. Science bloggers pointed out that the media coverage had inaccurately reflected the scientific report. These hominins hunted cooperatively, and consumption of the highest quality parts of large prey was delayed until the food could be moved to the cave and processed with the aid of blade cutting tools and fire. Delayed consumption of high-quality body parts implies that the meat was shared with other members of the group. ... Although not the earliest record of fire as technology in the Levant, Qesem Cave preserves contextual information about cooking and marrow extraction during the late Lower Paleolithic. ^ Watzman, Haim (31 December 2010). "Human remains spark spat". Nature. doi:10.1038/news.2010.700. Retrieved 16 November 2013. ^ a b c d e f Barkai R, Gopher A, Lauritzen SE, Frumkin A (June 2003). "Uranium series dates from Qesem Cave, Israel, and the end of the Lower Palaeolithic" (PDF). Nature. 423 (6943): 977–9. doi:10.1038/nature01718. PMID 12827199. ^ a b Fornai, Cinzia; Benazzi, Stefano; Gopher, Avi; Barkai, Ran; Sarig, Rachel; Bookstein, Fred L.; Hershkovitz, Israel; Weber, Gerhard W. (2016). "The Qesem Cave hominin material (part 2): A morphometric analysis of dm2-QC2 deciduous lower second molar" (PDF). Quaternary International. 398: 175–189. doi:10.1016/j.quaint.2015.11.102. ISSN 1040-6182. The Qesem Cave...site...has yielded...teeth associated to the...(AYCC) and dated to about 420-220 ka. ^ a b c Falguères, C.; Richard, M.; Tombret, O.; Shao, Q.; Bahain, J.J.; Gopher, A.; Barkai, R. (2016). "New ESR/U-series dates in Yabrudian and Amudian layers at Qesem Cave, Israel". Quaternary International. 398: 6–12. doi:10.1016/j.quaint.2015.02.006. ISSN 1040-6182. 420-200 ka...closer to 220 ka. ^ Hershkovitz, Israel; Weber, Gerhard W.; Fornai, Cinzia; Gopher, Avi; Barkai, Ran; Slon, Viviane; Quam, Rolf; Gabet, Yankel; Sarig, Rachel (2016). "New Middle Pleistocene dental remains from Qesem Cave (Israel)". Quaternary International. 398: 148–158. doi:10.1016/j.quaint.2015.08.059. ISSN 1040-6182. All archaeological finds at Qesem Cave have been assigned to the Acheulo-Yabrusian Cultural Complex (AYCC) of the late Lower Paleolithic. ^ Assaf, Ella; Barkai, Ran; Gopher, Avi (2016). "Knowledge transmission and apprentice flint-knappers in the Acheulo-Yabrudian: A case study from Qesem Cave, Israel". Quaternary International. 398: 70–85. doi:10.1016/j.quaint.2015.02.028. ISSN 1040-6182. The site of Qesem Cave...consists of AYCC layers only. ^ a b Gopher, A.; Ayalon, A.; Bar-Matthews, M.; Barkai, R.; Frumkin, A.; Karkanas, P.; Shahack-Gross, R. (2010). "The chronology of the late Lower Paleolithic in the Levant based on U–Th ages of speleothems from Qesem Cave, Israel" (PDF). Quaternary Geochronology. 5 (6): 644–656. doi:10.1016/j.quageo.2010.03.003. ISSN 1871-1014. ^ Mercier, Norbert; Valladas, Hélène; Falguères, Christophe; Shao, Qingfeng; Gopher, Avi; Barkai, Ran; Bahain, Jean-Jacques; Vialettes, Laurence; Joron, Jean-Louis; Reyss, Jean-Louis (2013). "New datings of Amudian layers at Qesem Cave (Israel): results of TL applied to burnt flints and ESR/U-series to teeth". Journal of Archaeological Science. 40 (7): 3011–3020. doi:10.1016/j.jas.2013.03.002. ISSN 0305-4403. ^ Parush, Yoni; Gopher, Avi; Barkai, Ran (2016). "Amudian versus Yabrudian under the rock shelf: A study of two lithic assemblages from Qesem Cave, Israel" (PDF). Quaternary International. 398: 13–36. doi:10.1016/j.quaint.2015.01.050. ISSN 1040-6182. ^ Barkai, Ran; Rosell, Jordi; Blasco, Ruth; Gopher, Avi (2017). "Fire for a Reason: Barbecue at Middle Pleistocene Qesem Cave, Israel". Current Anthropology. 58 (S16): S314–S328. doi:10.1086/691211. ISSN 0011-3204. ^ Weber, Gerhard W.; Fornai, Cinzia; Gopher, Avi; Barkai, Ran; Sarig, Rachel; Hershkovitz, Israel (2016). "The Qesem Cave hominin material (part 1): A morphometric analysis of the mandibular premolars and molar" (PDF). Quaternary International. 398: 159–174. doi:10.1016/j.quaint.2015.10.027. ISSN 1040-6182. ^ Verri G, Barkai R, Bordeanu C, et al. (May 2004). "Flint mining in prehistory recorded by in situ-produced cosmogenic 10Be". Proc. Natl. Acad. Sci. U.S.A. 101 (21): 7880–4. doi:10.1073/pnas.0402302101. PMC 419525. PMID 15148365. ^ Gannon, Megan. "Ancient Hearth Found In Israel Dates Back 300,000 Years, Scientists Say". Huffington Post. Retrieved 28 January 2014. ^ a b c d e Stiner MC, Barkai R, Gopher A (July 2009). 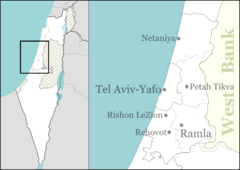 "Cooperative hunting and meat sharing 400–200 kya at Qesem Cave, Israel". Proc. Natl. Acad. Sci. U.S.A. 106 (32): 13207–12. doi:10.1073/pnas.0900564106. PMC 2726383. PMID 19666542.